This classic Italian Christmas bread you see in those funny shaped boxes in just about every supermarket this time of year, is somewhat of a holiday staple. 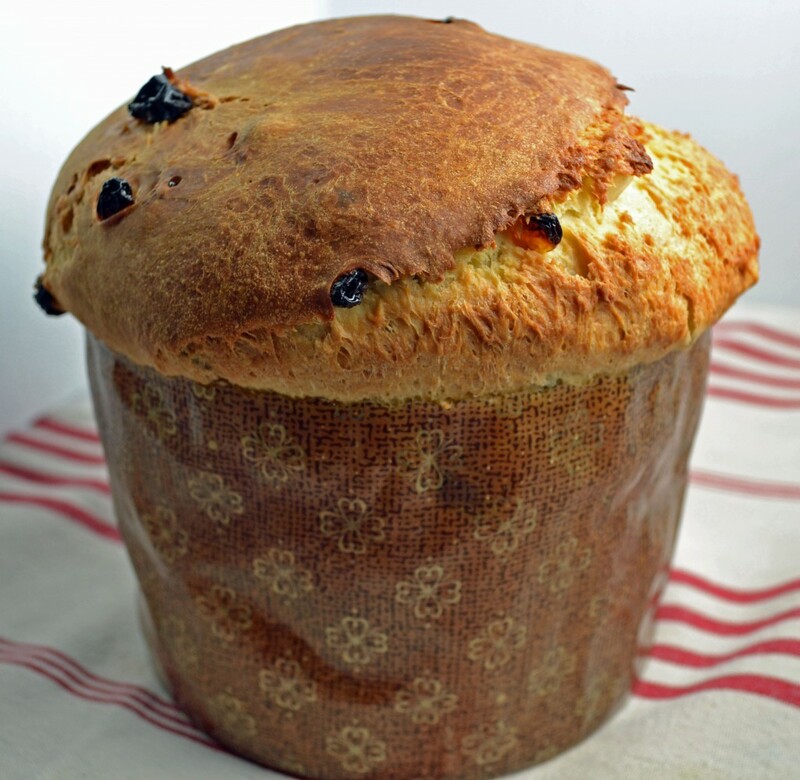 I’ve never been a huge fan of Panettone, but it’s hard to resist this rich sweet bread hot from the oven. It’s a fairly simple recipe that yields impressive results. In the original recipe from “The Art of Fine Baking,” my grandmother says to use the “extra-rich coffee cake dough” which calls for 12 eggs. Since I’m always a little apprehensive about recipes that use more than 8 eggs, I decided to use just the basic coffee cake dough recipe which uses a moderate 6 eggs instead. 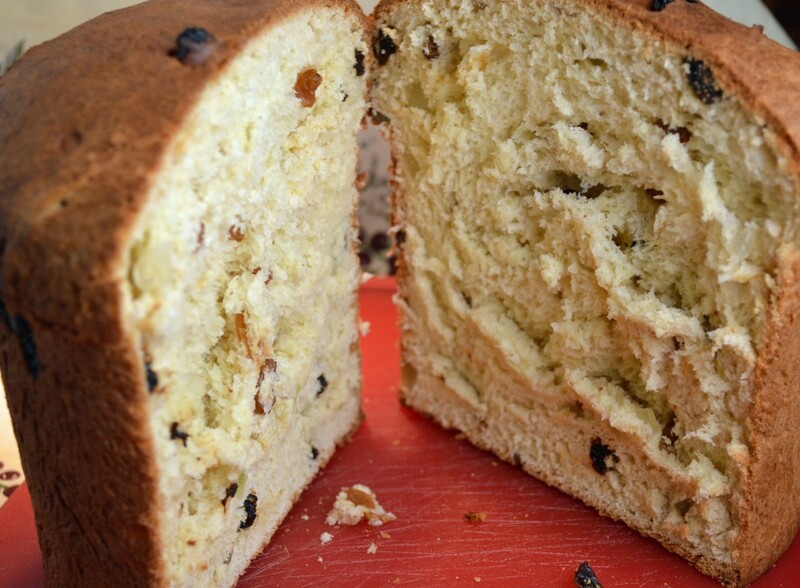 The result was perfectly satisfying- as I said, it’s hard to resist warm rich raisin bread right from the oven. Happy Holidays! If using Extra-Rich Coffee Cake Dough, follow recipe and add enough additional flour to make a fairly firm dough. Otherwise, follow Basic Coffee Cake Dough recipe. After dough has risen, knead in raisins and candied citron. Do not handle dough more than necessary after fruit has been added, or it will turn gray. Preheat oven to 400 degrees. Grease Panettone holders or grease a large baking sheet. Divide dough in half. Shape each piece into a ball. Place balls into Panettone holders or space well apart on greased baking sheets and enclose with a 5-inch collar made of greased heavy brown paper. Secure collars by pinning them (if necessary). Let dough rise until almost double in bulk. Brush with melted butter. Bake in preheated oven for 10 minutes. Reduce heat to 350 degrees. Continue baking 30-40 minutes longer, brushing twice more with melted butter. Bake until golden brown. Adapted from “The Art of Fine Baking,” by Paula Peck.